The process of multivariate testing and site optimization reveals not only what works and should be implemented, but also what doesn't work and should be avoided. Every website idea, whether content, functionality, or campaign-related, should be put to the test to determine if it helps or hurts the visitor experience. While some new ideas lift conversion rates, others fail — sometimes significantly. But even with these failures, there is definable knowledge gained over what to avoid the next time. The ability to test a new idea and 'look before you leap' is an unmistakable advantage that breaks the constraints on marketing innovation. Only then can marketers truly optimize their sites' conversion rates. 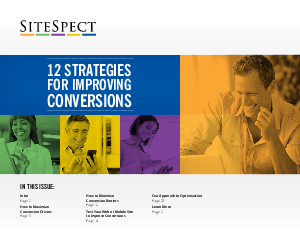 Download this new e-book now for a compendium of advice and insight that will help you improve conversion rates on your website!